Ever notice how a particular food can become all the rage only to drop out of fashion a few years later? And how the food or nutrient that our doctors told us to get more of in 1990, can morph into the one they are warning us against today? There is so much confusing and conflicting information out there it can be hard to keep it all straight. One such topic is that of fat and whether we should be eating low-fat or high fat, avoiding saturated or unsaturated, and even how to decipher what’s clever marketing and what’s actually healthy when it comes to shopping and cooking. That’s why we’ve come up with this guide and a few simple rules to follow that help you break it all down. But first, let’s make sure we’re all speaking the same language. Lipids – fats and oils. If it’s solid at room temperature, it’s a fat. If it’s liquid at room temperature, it’s oil. Lipids are a collection of molecules called triglycerides. Triglycerides – a molecule comprised of three fatty acids attached to a glycerol. Fatty Acid – carboxylic acids (COOH for you chemistry junkies) with carbon chains running 2-24 carbons long. The most abundant fatty acids in food are 16-18 carbons long. Saturated Fatty Acid – a fatty acid in which all the links between carbons on the chain are single bonds, leaving no free electrons to potentially share with something else. This is the most stable form of a fatty acid and is generally solid at room temperature. Unsaturated Fatty Acid – fatty acids with one or more double bond between carbons. If there is only one double bond, it is a monounsaturated fatty acid; two or more and it is a polyunsaturated fatty acids. The fatty acids in the families of omega-3, omega-6, omega-7, and omega-9 fall into this category. These are not as stable as saturated fatty acids, which is why they are liquids at room temperature. 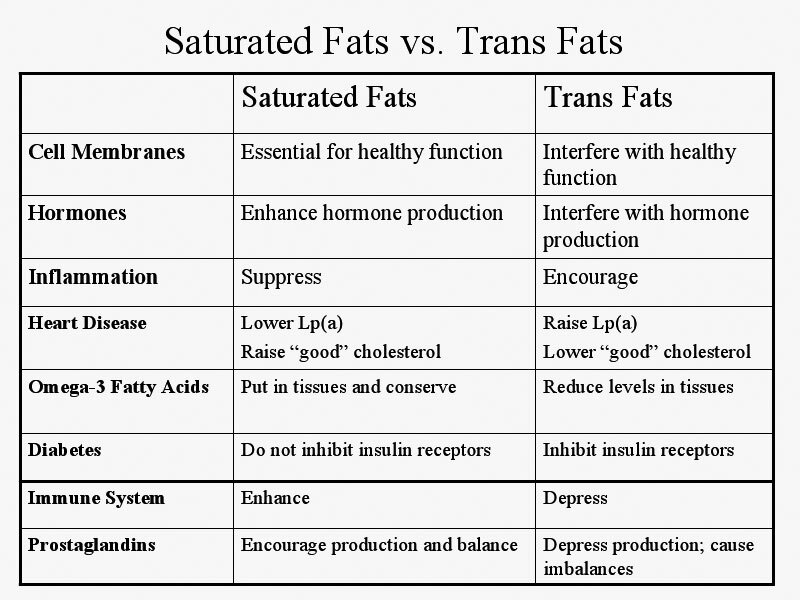 Trans Fatty Acid – an unsaturated fatty acid that has undergone the process of hydrogenation or partial hydrogenation. The fatty acid is bombarded with hydrogen atoms until those double bonds are broken up and the resulting free electron is shared with a hydrogen. These are really weird fats that look saturated, but the body generally doesn’t know how to work with them. There are some naturally occurring trans fats in ruminant animal fats, but these are different than the redheaded stepchildren coming from the hydrogenation process. Melting Point – the temperature at which a lipid goes from solid to liquid. Smoke Point – the temperature at which a lipid begins to break down to glycerol and free fatty acids. This is a bad place for fats as they can potentially turn into very toxic substances from here. For fifty years, scientists told us that too much saturated fat (butter) was bad for our hearts, and advised us to switch to polyunsaturated fats (I Can’t Believe it’s Not Butter aka margarine) instead. Oops. It turns out that polyunsaturated fats are not all equal, and some of them actually increase the odds of cardiovascular disease and death. Saturated fats don’t seem to be as bad for us as doctors used to think. Polyunsaturated fats are not equal in their effects. And the type of polyunsaturated fat you eat may be just as important as how much of it you eat. Ok, great! So, what fats should you eat? Follow these 2, simple rules of fat and you’ll be golden! Here’s one simplified way to understand the relationship between some different fat types. Fat type alone doesn’t determine the healthiness – rather, healthy fats are found in whole, unprocessed foods, while unhealthy fats are found in processed foods. For example, naturally occurring saturated fats (such as coconut) are important in a healthy diet. On the other hand, artificially created saturated fats (fats that start out unsaturated and are then chemically processed – for instance, through hydrogenation — to become saturated, such as margarine) are not as healthy a choice. Simply Put: Our bodies know what to do with real food. They don’t know what to do with the other stuff. The body needs all types of fatty acids (except trans fats) in order to function optimally. There’s no one-size-fits-all formula, but generally 2-3% of caloric intake should come from omega-6 fatty acids, and 1-1.5% should come from omega-3 fatty acids (trying to achieve a balance of 2:1 or 3:1 omega-6:omega-3). The rest of your dietary fat is going to be a combination of saturated and monounsaturated fatty acids, and the majority should be saturated fat. A key here is that if your diet is varied and you are eating whole, real food, you should be getting a pretty good balance of fats. If you’re eating mostly food by-products (convenience and processed foods), you’re likely getting way more polyunsaturated fats. Of course, these should mostly come from whole, unprocessed foods. We’ll give you some ideas below. Keep it simple. Keep it real. Keep it in balance. Fats are usually one thing that people will avoid in their diet, and when we think about it, it usually ties back to what we’ve become accustomed to hearing – eating fats will make you fat. This isn’t necessarily true, although if you are eating fats from processed foods in excess this could happen. So how do you work all this into your diet? This might be the most confusing thing for people to understand about fats – to cook or not to cook? Here’s an easy way to tell if which kind of fat is healthiest to cook with. Let me preface this with our definition of “healthy” fat: it comes from a natural, minimally processed source and the smoke point is high enough that the oil doesn’t burn, causing carcinogenic effects. Our good, high-temperature cooking fats are saturated fats so that means they are going to be solid at room temperature. If you also imply the “it comes from a real food rule” to this, that leaves you with coconut oil, butter tallow, lard and ghee. Gasp! Lard and butter!! Remember, you should be rotating through these oils as much as possible so you’re getting a good variety of sources and you’ll only be using the lard about once a week or so. If you are searing or stir-frying, stick with these oils as they offer a higher smoke point. For light sautéing, extra virgin olive oil is where it’s at, and sesame oil can be used for higher temp sautéing as can avocado oil. 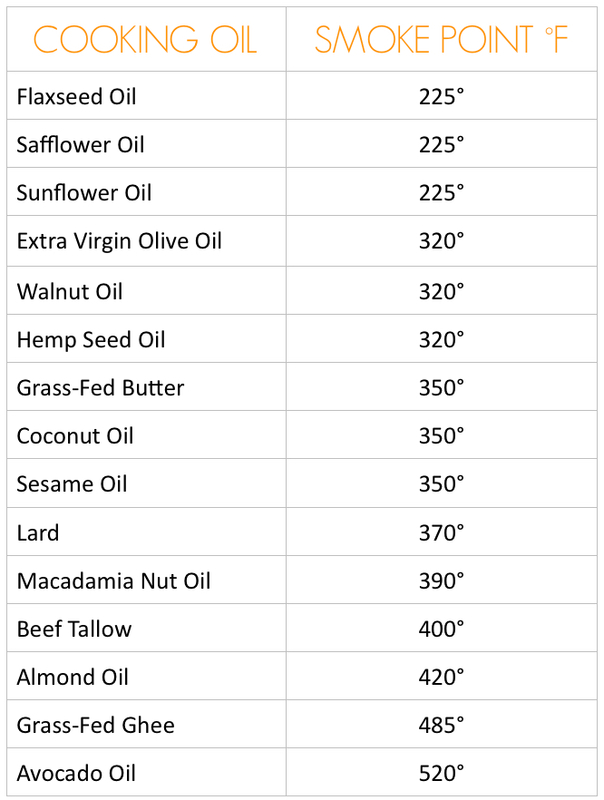 Please refer to the chart below for the smoke points of recommend cooking oils. You can use any of the liquid oils for dressings – we think mixing it up between extra virgin olive oil, avocado oil and MCT oil offers a good variety. Olive can be used when you want to impart a buttery/creamy flavor to your salad or dish or as a finishing topper. If you want your oil to be a more neutral vessel for another flavor, use avocado or MCT instead. In addition, we recommend avoiding these fats: peanut oil, vegetable shortening, Canola oil, grapeseed oil, corn oil, sunflower oil, vegetable oil, soybean oil and safflower oil. Coconut milk is another healthy fat option that you can use in your cooking. It is great raw and in place of milk for smoothies, meal replacement shakes, etc. and can also be used in soups, curries, sauces and more. Look for one that’s 100% coconut milk. Healthy fats are usually easy things to have around for snacks which makes them convenient, but also puts you at higher risk of getting carried away with mindless snacking. We recommend portioning out a single serving for yourself versus snacking directly from a bag of nuts. To add them to a meal, sprinkle over a salad or fruit or look for some new recipes that incorporate these like “nut crusted” items. Nut butters made of the nuts listed above are great for dessert and condiments. Nut flours (almond, pecan and chestnut) and unsweetened coconut flakes are great for baking. But remember, baking is normally for treats so these should be used in moderation. Peanuts are NOT nuts; they are legumes. What If I Am Eating Animal Protein With My Meal – Doesn’t That Include Healthy Fats? Yes, of course it does, but depending on your caloric requirements as an athlete, you may want to add fats to your plate in order to meet the energy requirements to sustain your training. In addition, most animal proteins contain saturated fats, and as we mentioned earlier, you want a balance of saturated, monounsaturated, and polyunsaturated fats in your diet. One way to add more healthy fat is to drizzle your vegetables with an oil rich in monounsaturated fats such olive, avocado, or macadamia. It all goes back to: Keep it simple. Keep it real. Keep it in balance. Does it come from a real food source? Does it require minimal processing (YOU could do it yourself) to consume? Are you getting a variety? If you can answer yes to these questions, then eat it! If not, avoid it! What’s your favorite way to incorporate fats into your diet?